Introducing our Project Manager, Russ. He became part of the Nosan Signature team about a month ago. 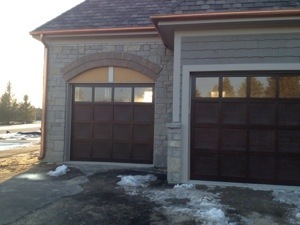 Russ is a skilled carpenter and has a keen eye for detail and quality. He has been involved in this job for some time on a part time basis but is now with us full time. Russ agreed to come on board even though he knew first hand how picky I am. I guess that’s because he’s pretty picky too! 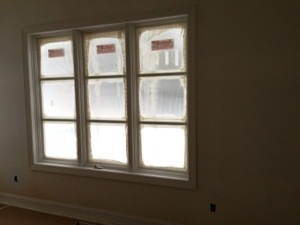 The drywallers have done all of their touch ups.The tile contractors have set most of the tile in our five full bathrooms (two of them with electrically heated floors) and back hall areas. 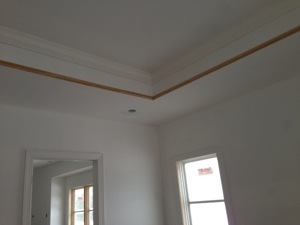 And the painters have carefully prepared all the millwork and walls and ceilings for their finish coats. Because we sweat the details on the front end things tend to come together pretty well now with very few surprises. That’s the way it’s supposed to be but it doesn’t just happen. It takes folks like Russ to make it happen. Oh yeah – He’s a Wolverine too! Go Blue! It’s been a couple weeks and we have made much progress. 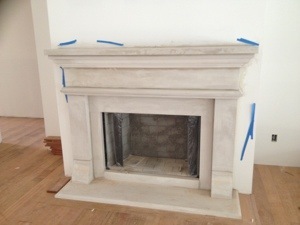 The fireplace hearth and surround – all carved limestone – has been installed! 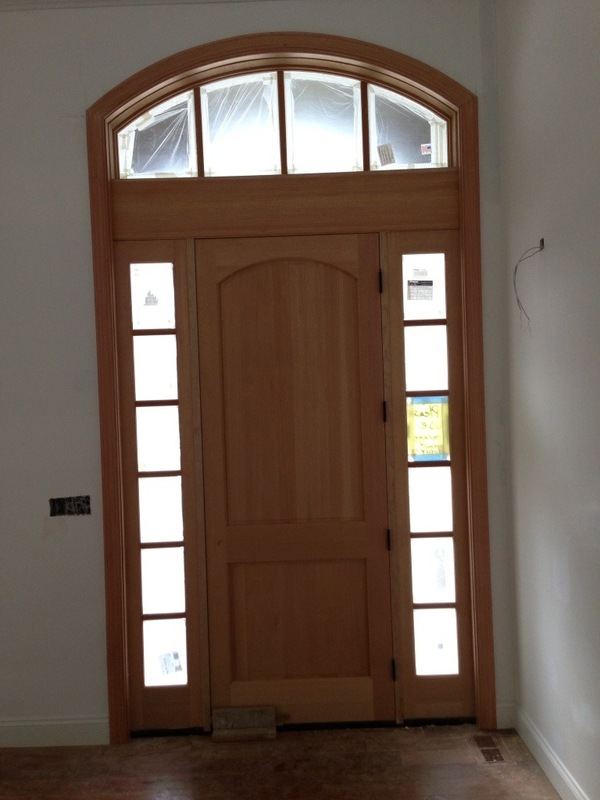 Wood floors throughout the house are complete, the front door and transom window above have been set in place. 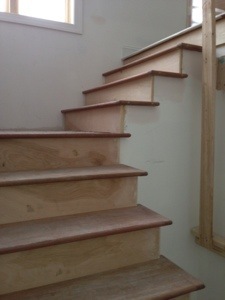 The lower level is totally caught up with upstairs so we can finish it out all together. The finish (or trim) carpenters will arrive Monday to a house full of doors, cabinets and moldings to assemble and closet shelving to build. You will see what looks like amazing progress in the coming weeks as it all comes together but, if you have followed us from the beginning you will recognize that the hard work was the planning required to allow us to make the finish happen smoothly. At least we hope that will be the case! Between the mid-week 4th of July Holiday, the storms, heat and humidity, not much got done on site this week. But no fear, there is always planning and research. We all know how hard it is sometimes to decide what we want in our own home but when we are building a speculative home and trying to design for a future homeowner we haven’t even met yet, the anxiety level can get pretty high. When we start committing to walls, cabinets, countertops, tile and plumbing fixtures we are always leaning toward the thing that is most appealing (or least offensive) to the most people! 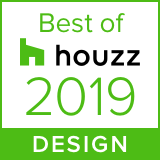 Sure, we have the opinions of our architect, friends, prospective customers, our sales people and the contractors that are working on Our Home, all of whom see what’s most popular in the projects they have worked on recently. In the end, it falls to us, the builders, to make the call. The buck stops here with and mistakes can cost us big bucks! I took the plan and my sketch to a Certified Kitchen Designer that works for our cabinet supplier. Liz liked the wall idea too. She sells cabinets so of course she feels more are needed – just kidding Liz :-) . 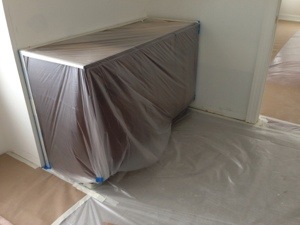 Now she will determine where the sink and appliances should all go and what types of cabinets to put where. She will make sure the kitchen works well for our future homeowners and that it is an asset in helping us close the sale. So what do you think? Your comments are welcome. We will post Liz’ plan when we get it.